A continent enslaved. The fates of nations in the hands of those in their late teen years or early-20s. 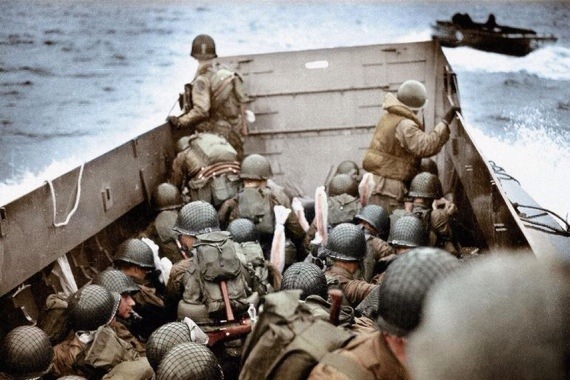 A disastrous landing on the Normandy beaches for the Americans. You read often about how D-Day was the beginning of Europe’s liberation. But, it wasn’t smooth sailing by any means. For months, Allied forces were barely able to move. Normandy comprised of a patchwork of many fields, each of which was surrounded by impassable thickets of tall trees called hedgerows (see below). The invasion bogged down. D-Day planners didn’t know about the hedgerows. Casualties were enormous. Then, Sergeant Clive Cullen, a cab driver from Chicago, invented in the field a hedgerow cutter, which was attached to tanks. This allowed squads to penetrate the fields and take ground, bit by bit. In the end, it worked. After many months, the troops pushed through and then raced to Paris. Yet, the sacrifices were enormous. 92 year-old John Trippon landed on D-Day and was interviewed for a NY Times article (here). 560 men in his cohort landed on D-Day; 120 went home. I’m going to think about that the next time I start to complain about traffic, long lines, and the challenges of daily life. Remember our veterans and troops today….